Sadly, the sailing season is drawing to a close. Luckily, the weather was very good in September, which compensated for the rather changeable summer. As intended, we went sailing, but not with our “Henri Mer” that I told you about in the previous edition. That boat was sold just before the completion date. And that was not to the liking of my husband and children I can tell you. They were all annoyed with me. But let’s face it, “business comes before pleasure”… and so “Henri Mer” became “Katharina”. We came across her on a few occasions with a happy owner on board. And we shed a tear. However, we soon got over it and we went sailing, on board the “Amulette”: a splendid 43.9 AC and how we enjoyed it! Mathijs and Sophie are still asking when are we going sailing again. It was even so enjoyable that we decided, together with friends who were on board a 30.9 AC, to go for another two weeks. 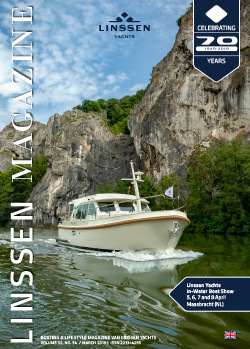 For our friends, by the way, it was the first sailing experience with a Linssen. Luckily, they caught the boating bug and so even more holidays on board are likely to follow. We enjoyed a very pleasant trip along the Zuid-Willemsvaart canal and, needless to say, along our own River Meuse. For the children, however, the highpoint was the ‘beach’. A sandy beach in one of the many dredging pits here on the Maasplassen lakes. Drop the anchor and just enjoy it. I really shouldn’t tell you about it, otherwise you will all be there next year. Nevertheless, it’s still a nice location on the water in Limburg. And if the weather’s fine, it’s just as good as the French coast, but almost in our own back garden. Just imagine it. Good weather, sand, water, BBQ, own boat, glass of wine and friends. In other words: pure enjoyment! Isn’t that what life’s all about! My conclusion is that enjoying the water is for everyone. Sailing, speed boating, motor boating, surfing, diving, water skiing, jet skiing or swimming. For young and old, on your own, or with a partner or family. I don’t know of any other hobby that you can enjoy in this way with the entire family. Enjoying the surroundings, the boat, a board game with the family, a glass of wine, breakfast on board, but especially, enjoying each other’s company! I look forward to hearing about your sailing experiences at the next Linssen Yachts Boat Show. Until then!